Hooray! Hooray! The Emoji Movie opens today! Jump on the summer’s hottest trend with an emoji-filled classroom, office, or kitchen, straight out of Textopolis! 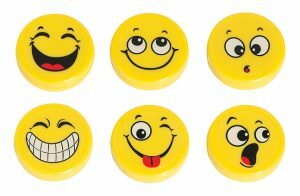 Our set of Emoji Big Button Magnets comes with three, double-sided, emoji magnets, each depicting a different emotion. Flip these super strong, super safe, and super silly magnets to depict laughing, proud, happy, silly, surprised, and uh oh! Plus, each magnet holds up to 10 pieces of paper, so they’re perfect for holding stacks of handouts, homework, bills, and other papers. And of course, a fun way to display children’s work and art pieces. And, since the magnets are completely encased in plastic and jumbo-size, they’re perfect for environments with young children, too! Use them to help little ones learn to express their emotions or just to add a bit of fun to your space! Our colorful, Emoji Big Button Magnets measure 1.375”D x .5”T each and retail for just $5.99 a set.